Britain's nuclear reprocessing site Sellafield has said elevated levels of radioactivity were due to naturally occurring background radon, and not any issue with its operations. "Our in-air monitors are extremely sensitive and pick up on any abnormality," it said, in a statement on its website. "Overnight the monitoring system initially indicated elevated levels of activity. Following investigation and analysis, we can now confirm these levels to be naturally occurring background radon." The site had earlier told non-essential staff to stay away from the site. Sellafield lies about 180km from Ireland's coastline. In a statement, the Department of the Environment said: "Levels of radioactivity detected are well below that which would call for any actions to be taken by the workforce on or off the site. There is no risk to the public or workforce. "Officials from department have been in contact with their UK counterparts in the Department of Energy and Climate Change (DECC) and will receive updates throughout the day. "The Radiological Protection Institute of Ireland (RPII) have been in contact with the UK Office of Nuclear Regulation (ONR) who consider the levels to be very low and the RPII will continue to monitor the situation." 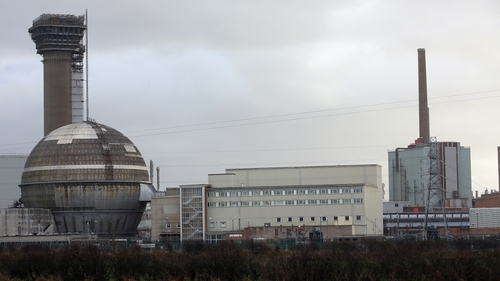 The Radiological Protection Institute of Ireland has said it is keeping a watching brief on the events in Sellafield. A spokesman said it had been in contact with counterparts in the UK, the Nuclear Regulatory Commission, and would monitor how the situation progresses.